For the finale of Matt Paetsch’s October Residency at Dicks Den on October 29th, the local bassist extraordinaire has put his own twist on the standard Halloween show to benefit the local community. 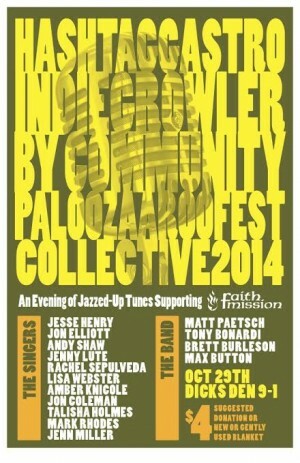 In a nod to overused buzzwords everywhere, the event is officially called Hashtaggastroindygrowler By Communitypaloozaaroofestcollective 2014, and all door proceeds will be donated to the Faith Mission homeless shelter downtown. The show will run from 9pm to 1am, and the suggested donation is $4 or a new or gently used blanket. As Paetsch told me, “The concept is a reverse-style Halloween show. Rather than dressing up as an artist and playing their music verbatim, we’re dressing the music up in different jazz styles.” He arranged a bevy of popular tunes by artists ranging from The Beatles to Danzig to Beyonce, so there should be something for all music fans to enjoy. Paetsch enlisted many of Columbus’ top vocal talents from across the musical spectrum to each sing a few songs: Jesse Henry, Jon Elliot, Andy Shaw, Jenny Lute, Rachel Sepulveda, Lisa Webster, Amber Knicole, Jon Coleman, Talisha Holmes, Mark Rhodes, and Jen Miller. The house band for the evening will consist of Paetsch on bass, Tony Bonardi on keyboards, Brett Burleson on guitar, and Maxwell Button on drums. Come out for a unique event supporting a great cause.